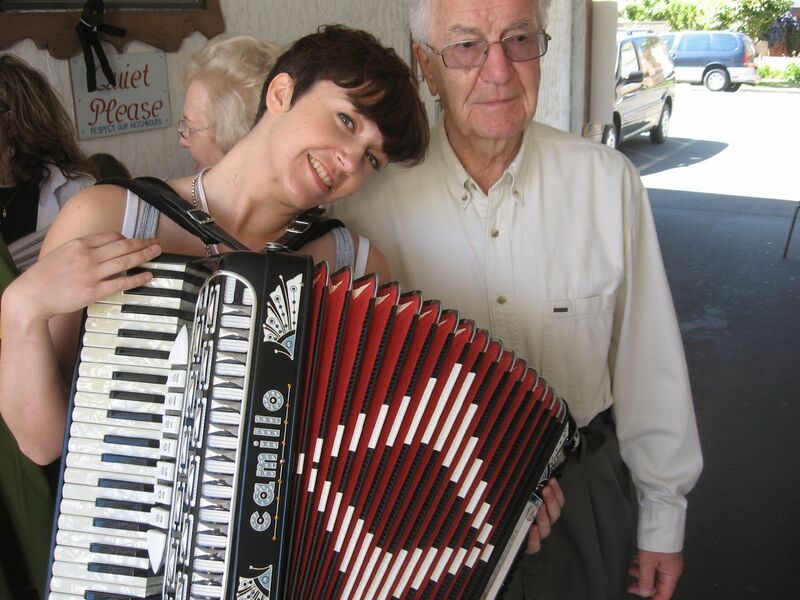 MISS NATASHA ENQUIST: ELECTRO-ACCORDION CHANTEUSE: Does this make me look patriotic? Does this make me look patriotic? I notice every so often a family in the crowd, within the Italian Pavilion, that are Canadian. The giveaway is usually what they're wearing: an Oilers t-shirt, or Team Canada apparel from HBC or some Lululemon gear. But also, that they're usually slim or fit, and there is just a look that Canadians have. It's a look of kindness, politeness, knowing, and nice smiles. During one of our shows at the beginning of our week I noticed a very cute sister and brother, who were wide eyed, front and centre watching our show. 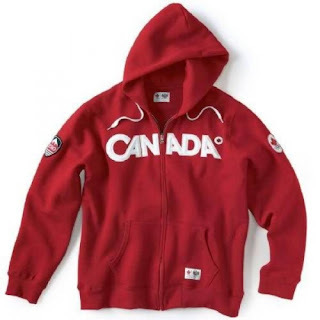 The young boy wore a red "Canada" apparel sweatshirt, and the perfect pair of Mickey ears. His sister had on a Minnie Mouse dress. We used them in one of our scene's, and at one point I quickly asked them if they were from Canada and the older sister nodded and said "Yes". I soon figured out who their parents were, and they had big smiles and were enjoying the show. After our set was finished and my cast mates and I were returning to our trailer backstage I suddenly burst in to tears. I was overcome with missing my country, not sure exactly what I missed as I am happy to be doing what I love, and happy to be in this new chapter, but I was homesick for Canadians. I miss how Canadians talk, and I miss our cynicism, and our black humour, our disdain for the news, and our healthy food options. I was missing The Great Giffoni's magic shows, even though what I'm doing now is like a giant birthday party all day long - filled with cute kids that dress up like little pirates and princesses. I calmed down, realized what I felt was completely normal, and the next day at work the family came back! That's a nice feeling when you have guests return to the show, and The Ziti Sisters have many! The kids were picked to be the flower girl and boy in the wedding scene, and they did a great job. Yesterday, the cats came back (for the third time!). This time the dad was selected to be in our "History" scene, and so I had the opportunity to chat with him, and found out they were from Calgary, and I let him know I was from Victoria. He asked me how I liked it here, and I told him "It's different", and he replied "You miss home". It was nice to see them again, having them around really comforted me, I hope they had a great time. 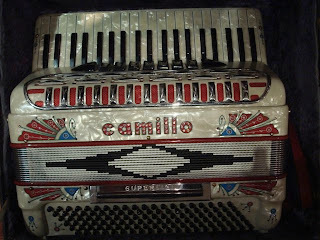 I got a cool email the other day from a musician that had the same accordion as my "Camillo" and was curious to know more about it. I informed them that our accordion's were definitely siblings, and that the story behind our accordions goes something like this: the Canadian Accordion Institute had Robert DeCamillis order up accordions for them, and he went to the Guerrini factory - who would personalize accordions for you when doing mass orders. Bob created the 'Camillo' name from his own last name. This was during the 1960's, and now these Guerrini "Camillo's" are floating around. My emailer received the "Camillo" from Richard Bell, who had passed away, and used to play in The Hawks (with Ronnie Hawkins, before they were The Band), played in The Band after Robbie Robertson left, and also played with Janis Joplin’s Full Tilt Boogie Band. I had met Bob "Camillo" DeCamillis several years ago at an accordion festival in Victoria BC, where he began bidding on my accordion - which wasn't up for sale to begin with. 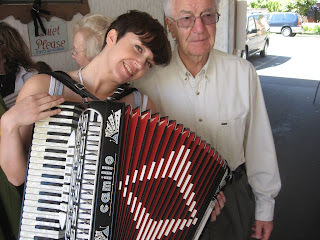 He was very sweet and bought several items from my "Squeeze Me - Accordion Chic Apparel" line. I had a random memory pop in to my mind just now about how a woman in the audience (a couple of weeks ago) informed me mid-show that "See the man in the cowboy hat? He plays the accordion too". Oohhh... okay. I was left wondering why I was told this, and thought "Do the other Ziti's have friends of actors come up and tell them "See that woman in the visor? She does community theatre"." 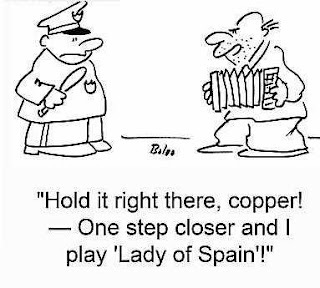 Right near the end of our show, still doing a show... the woman yells to me "Lady of Spain! He plays that all the time!"